Got kids? They will be entertained as well with the bounce house, games, piñata and craft stations. We will also provide bread to feed the ducks in the huge pond located right beside us. Family Fest has something for everyone! You can bring a picnic or buy food at the celebration, either way, come spend the day with us! There is plenty of shade, a covered arbor with tables and an entire section of the park, just for us! Pets and alcohol are allowed, please be responsible with both. A special thanks to Gay Central Valley. Their support helps make this event happen. We do have a continual need for donations and/or raffle prizes if you find that you are able to help us. Please contact me and THANK YOU!! 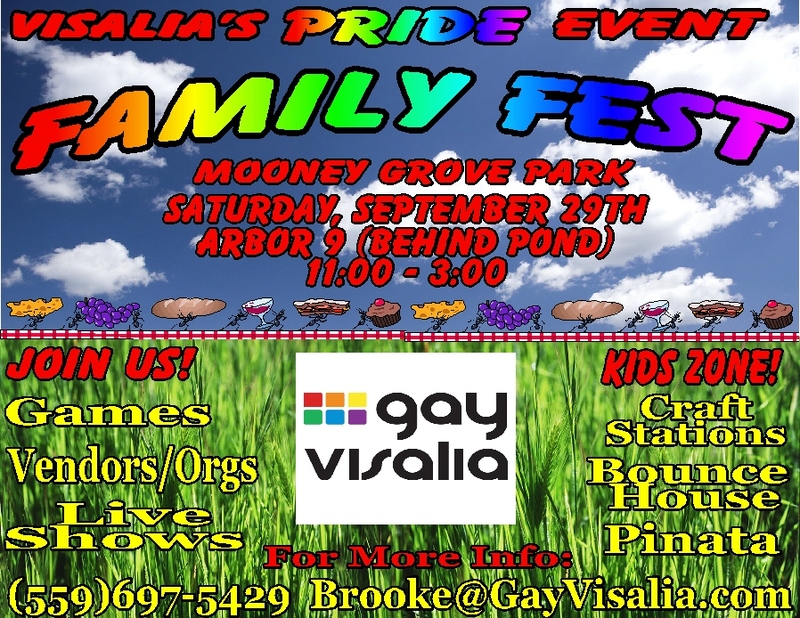 Family Fest really is Pride at its best, see you all in September!